Remove the rind from the cheeses and cut each cheese into small cubes. Cut the bread into small pieces. Rub the fondue pot with the garlic clove and then add the white wine (reserving a small glass). Place this over a low heat. Add the corn starch to the small glass of white wine, mix together and add to the fondue pot. Add the cheese a handful at a time and stir until it melts. 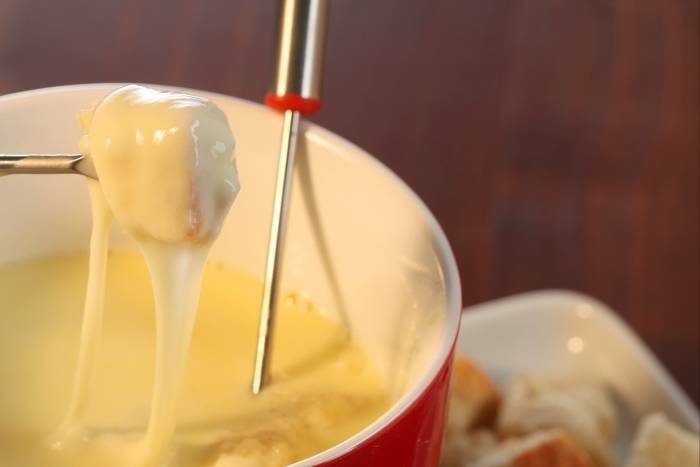 Stir in a figure of eight pattern until you have a smooth, creamy fondue. The fondue should resemble a thick sauce: if it is too thick, add a little more warmed white wine. If is too thin, add more cheese or corn starch mixed with white wine. Remove the fondue pot from the heat and add the pepper, nutmeg and salt. Place the fondue pot on a hot plate or burner on the table to serve. Stir often to keep the fondue smooth. Spear the bread on to fondue forks, dip into the fondue and enjoy!